With so much attention these days on whether Tesla will be profitable, and whether or not its business model is viable for the foreseeable future, another iconic automaker is approaching dire financial straits: Jaguar Land Rover. 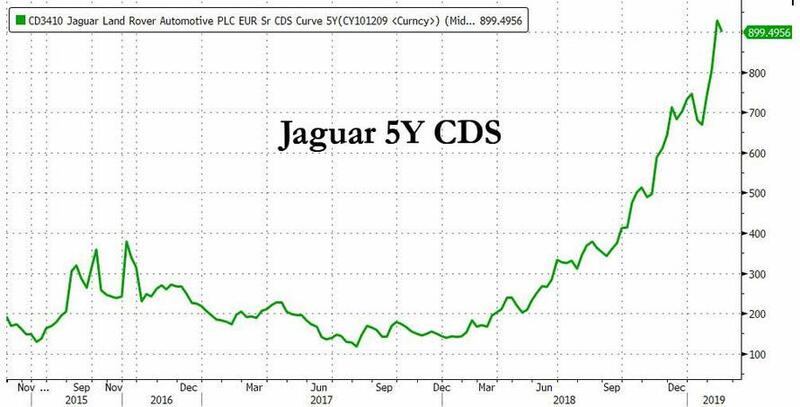 As the following chart shows, over the past year, CDS on Jaguar Land Rover Automotive PLC has soared from just 150bps to 900 bps. 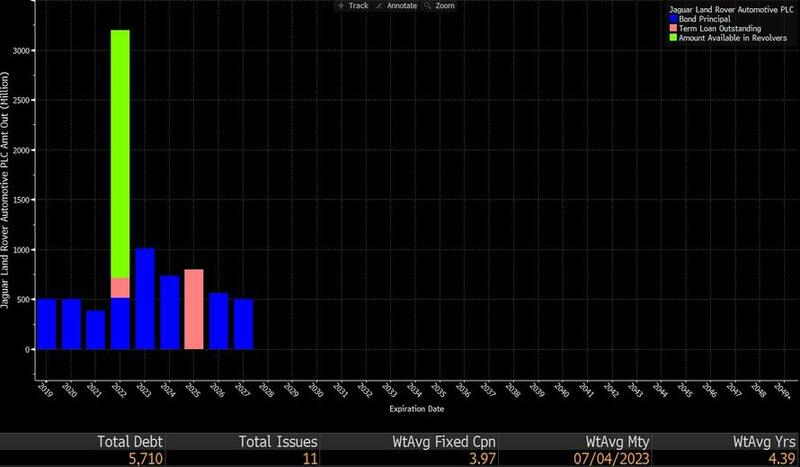 As a result, the probability of default for the carmaker over the next 5 year has soared to 54%, with its default odds over the next 3 years as high as a third. 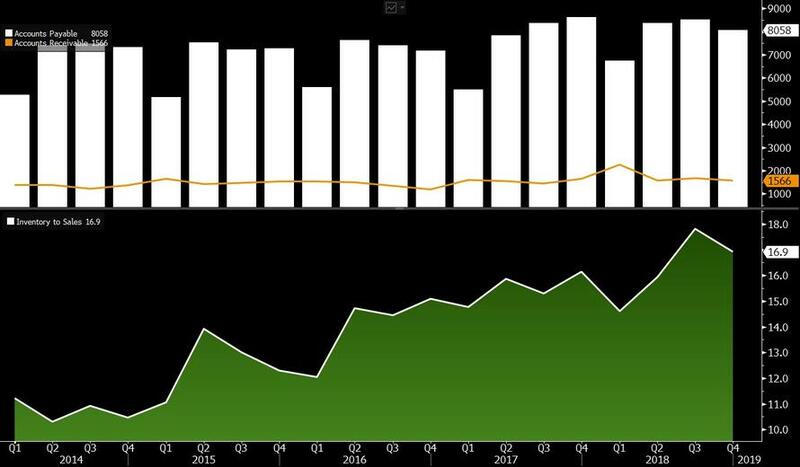 The good news is that Jaguar anticipates generating free cash flow in its fiscal 4Q as inventory is lowered, but as Bloomberg’s auto team suggests, the company may seek an $750 million-$1.5 billion of additional capital to help bridge its liquidity needs. The reason for that is a steep debt maturity profile as the company considers a $500 million debt maturity in November 2019, while cash usage could exceed $2 billion in fiscal 2020, which will jeopardize Jaguar’s traditional plan of having liquidity of 12-15% of sales. That could be $4-$5 billion for fiscal 2020, especially when considering the company upcoming debt maturity schedule, which sees over $2 billion in revolver liquidity in question after 2020 unless the company can successfully roll it over at similar terms. What is the reason for Jaguar’s distressed liquidity profile? As Bloomberg notes, the company’s working-capital profile has sharply deteriorated over the past few quarters, as bloated inventory levels pressure liquidity and potentially require even more severe discounting in periods ahead. Meanwhile, its high level of payables to receivables also leverages the potential risks of an industry slowdown on its liquidity outlook. Making matters worse, is the deterioration in Jaguar’s core China market, where EBIT margin was -10.6% in fiscal 3Q (vs. 7.8% last year) as retail sales dropped 40%, pricing pressures intensified and reduced production occurred. Does this mean that absent a sharp rebound in the Chinese market, iconic brands such as Jaguar, Land Rover and Aston Martin will soon disappear? Hardly: after all the company will continue operating in bankruptcy, even if its parent, Tata Motors will no longer be in the picture. 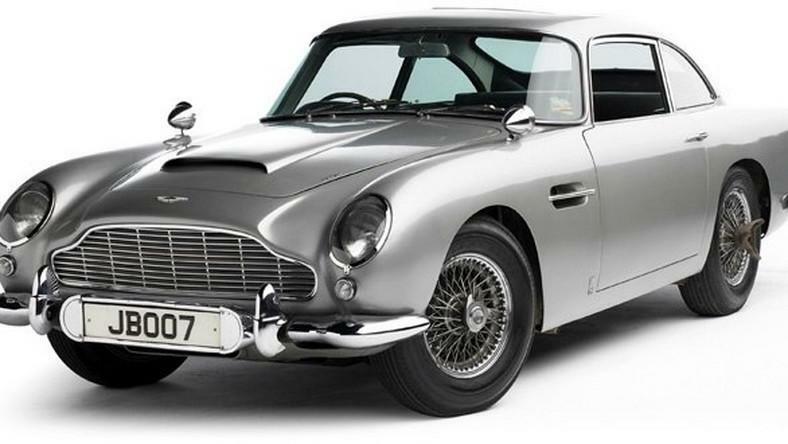 The only question is who will be the proud owner of James Bond’s favorite car maker a few years from now. Next Next post: S&P Surges To Key Technical Level – Now What?